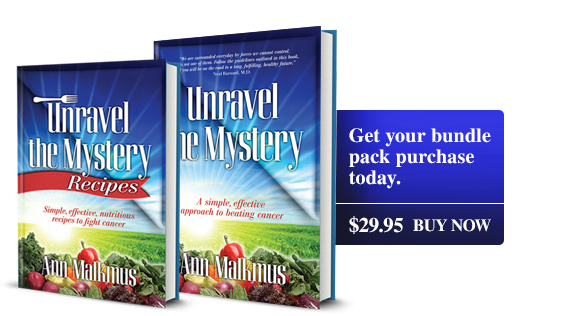 Unravel the Mystery, A Simple, Effective Approach to Beating Cancer is a life changing book that reveals the causes of cancer and how to harness the body's miraculous self-healing power through nutrition, lifestyle changes and minimizing daily toxin exposure. It highlights today's leading research, and answers key questions and most importantly puts into perspective all the components necessary to help people restore a healthy immune system and beat cancer. Unravel the Mystery - Forward by Neal Barnard, M.D. Unravel the Mystery - Forward by Francisco Contreras, M.D. 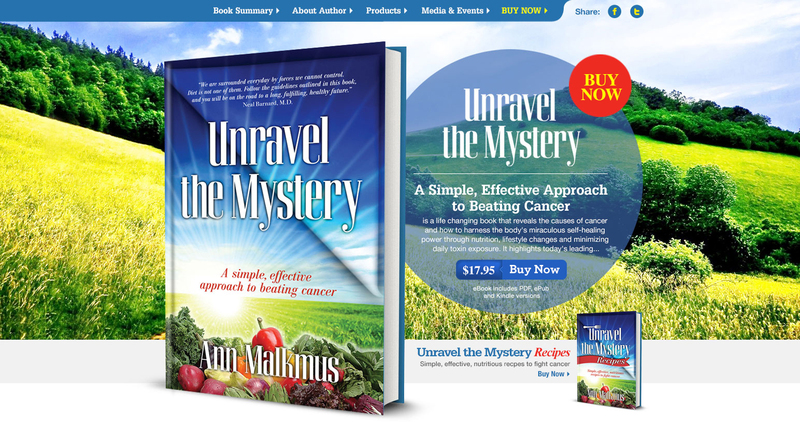 Take a look at the ins and outs of Ann Malkmus revealing a simple effective approach to obtaining the knowledge on beating cancer. Select tab below to obtain more information. Ann Malkmus is a wellness educator, advocate and consultant. Over the past decade, she has developed hundreds of health and wellness programs -- reaching single audiences of more than 10,000 and impacting hundreds of thousands of people throughout the United States, Canada and 50 other countries around the world. Her life's work is centered on a single yet powerful belief that we each have a miraculous, self-healing body and that through nutrition, simple lifestyle changes and detoxification we can achieve renewed, vibrant health. A powerful speaker and motivator, Malkmus empowers others with a message of health, hope and healing. She speaks at conferences and events throughout the globe while sitting side-by-side with some of the world's leading doctors, thought leaders, and nutritionists. Malkmus is passionate about educating individuals, particularly women, of all cultures and lifestyles, ages and stages how to maximize their life's potential by taking control of their health. An accomplished, award-winning debater and prodigious speaker, Malkmus garnered state and national recognition addressing The National Press Club as well as keynote engagements around the country and the world. Her successful career, however, was halted when Malkmus began suffering from chronic Irritable Bowel Syndrome (IBS) and fibromyalgia. Compounding her own fragile condition, her younger daughter began experiencing severe asthma attacks and was later diagnosed with rheumatoid arthritis as a pre-teen. Seeing her daughter suffer, bloated from steroids, she galvanized her academic and educator's "DNA," becoming like a mother bear protecting her young cub. Malkmus became a voracious reader, researching everything she could get her hands on to find solutions to both support and help heal her daughter and herself. After changing their diet and lifestyle through The Hallelujah Diet! ™, both Malkmus and her daughter overcame their serious health challenges and enjoy great health. Currently, Malkmus is the chief of education of The Hallelujah Diet! one of the country's leading health and wellness brands which has been proven to combat nutritional deficiency, reduce toxicity and improve overall health. In this role, she is responsible for ensuring that the international company's educational and training programs are presented in easy, practical and useful ways. Malkmus in collaboration with her husband Paul, has developed educational videos that assist individuals in making practical lifestyle and diet changes. She has also created and presently manages online and on-site training and leadership programs for the organization -- teaching individuals from as far as the Philippines, China and Iceland. Malkmus was inspired to write Unravel the Mystery, A Simple Effective Approach to Beating Cancer after losing her step-son Joshua to Hodgkin's Lymphoma in 2011 at age 18 as well as traveling the globe hearing thousands of stories about those battling cancer and other chronic diseases. The book is a continuation of Malkmus' life-long quest for the latest in nutritional research as well as an eye opening look at well over 30 toxins that people unknowingly are exposed to on a daily basis. Malkmus holds a B.S. in speech and organizational communication from the University of Wisconsin -- Platteville and an M.A. in communication from the University of Dubuque in Iowa. A native of New Holstein, Wisconsin, Malkmus currently resides in Charlotte, NC with her husband Paul. Unravel the Mystery is Malkmus' first book. 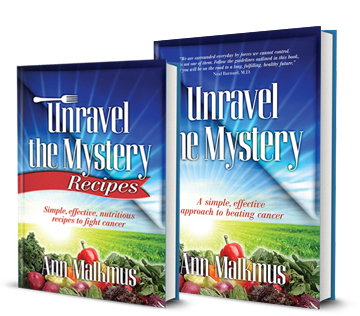 She has completed a companion recipe book, Unravel the Mystery, Simple, Effective and Nutritious Recipes to Fight Cancer. (GASTONIA, NC) February 4, 2014 – Health advocate, wellness coach and educator Ann Malkmus is marking the start of Cancer Prevention Month this February with the national release of her new book Unravel the Mystery, A Simple Effective Approach to Beating Cancer, a comprehensive guide to unconventional steps individuals can take to harness their bodies' natural healing abilities to fight the disease. The book is Malkmus' latest work that addresses both prevention and recovery of cancer which the Centers for Disease Control and Prevention (CDC) sites as the second leading cause of death in the United States by integrating diet and lifestyle changes to complement traditional therapy. The book (1) pinpoints key toxins that promote cancer and the dietary and environmental steps to fight them; (2) outlines user-friendly steps to reduce risk; and (3) shares crucial information and actions that people with cancer and their caregivers can take to support their bodies while working with oncologists on the road to recovery. This month, Malkmus will donate 100 copies of the book's initial run to people fighting cancer and families in cancer treatment centers and support groups in her home state of North Carolina along with releasing a limited edition e-book at an introductory price of 99 cents to spread the knowledge and potentially help save the lives of millions. "Where there is breath, there is hope," exhorts Malkmus. "When we harness the miraculous, self-healing power of our bodies -- through nutrition, simple lifestyle changes and detoxification -- we can and will experience renewed, vibrant health. A "must read" for individuals with cancer or anyone who is supporting someone battling the disease Unravel the Mystery demystifies today's leading research, answers key questions and most importantly lays out a clear guide to help people beat cancer. Malkmus' book is much more than a diet and nutrition guide it is an empowering tool that includes a cancer-recovery "checklist" that individuals should incorporate in working proactively with their oncologists. It also recommends nutritionally powerful foods along with other effective methods to help create a healthy immune system. A former college dean and current educator, wellness consultant and lecturer, Malkmus has managed health and wellness training programs reaching more than 10,000 individuals in one seminar, and impacting hundreds of thousands throughout the United States, Canada and Africa. She currently serves as the chief of education for The Hallelujah Diet! ™ one of the country's leading health and wellness brands which has been proven to combat nutritional deficiency, reduce toxicity and improve overall health. Malkmus speaks at conferences and events throughout the world while sitting beside some of the world's leading cancer doctors, registered dieticians and nutritionists. "Ann Malkmus does a phenomenal job in her book of identifying the toxins that contribute to cancer and offers classical steps to help reduce risk of the disease," said Michael Donaldson, a nutritional and research expert who earned his Ph.D. from Cornell University. "She is a passionate advocate whose research-based recommendations will help to restore health and transform lives." Unravel the Mystery is rooted in scientific research and complements Malkmus' personal insights gained from her experience working closely with individuals and families in the United States and all over the world. Malkmus was inspired to write the book after losing her stepson Joshua to Hodgkin's Lymphoma in 2011 at age 18. It is her hope to help others navigate through the vast information and confusion that often accompanies a cancer diagnosis, by providing straight-forward information and simple steps to help people achieve a better outcome in their battle with cancer. 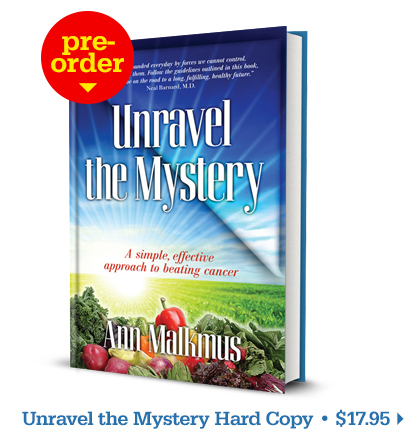 A limited edition Unravel the Mystery, A Simple Effective Approach to Beating Cancer e-book is now available at Amazon.com for the special price of 99 cents from February 4-9, 2014. After February 9, the e-book will retail at $12.95 and paperback at $17.95 at Amazon.com,Barnesandnoble.com/NOOK, Kobo.com and select bookstores nationwide. A portion of the proceeds from the book sales will benefit the Joshua Malkmus Children’s Foundation to support children’s health. 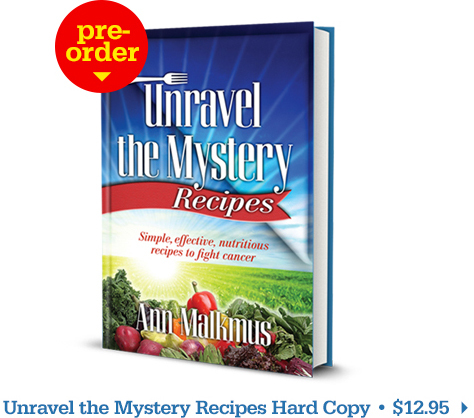 Malkmus is working on a companion recipe book Unravel the Mystery, Simple, Effective and Nutritious Recipes to Fight Cancer, that focuses on diet and cancer recovery, in addition to a new menopause wellness program.